My friend sent me a text the night before the race that said “Good luck tomorrow! Make the trip worth it!” (It had been a long week and the thought of “is it really worth this much effort” did enter my mind). Make the trip worth it. That sat in my head for a minute and I thought, she is right. Why let a “nightmare” (nightmare in terms of how you want a typical pre-race week to go) of a week ruin what could still be a magnificent day. 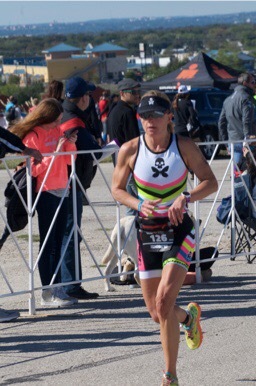 I am pretty sure I had more pre-race mishaps then ever… I won’t share all details (keeping this one positive) but the flight into Austin being cancelled was sort of my breaking point. That’s when everything started to be “laughable”. Instead of landing around 4pm on Friday, I arrived at my brother’s home (with two kids in tow) around 2:30am on Saturday after a very long evening of travel, thunderstorms, and friendly sheriffs. Not ideal, but at that point, I felt lucky I could even get into Austin before Saturday night (joy of flying)! I’m here, let’s celebrate that and move forward. Smile. Saturday was a long one, and sort of a comedy of errors. Let’s just say a lot of driving around (which didn’t include any site recon or me riding my bike as I might normally do). Stay positive. Thank goodness I was with a dear friend who made the day enjoyable instead of painful! As I was sorting out last minute race bags that evening, I sent a quick quasi-positive note to a friend who has done this race numerous times “why do you love this course again”? This was after me spending the day in the cold rain and hearing the roads (bike course) were ripped up due to the effects of Hurricane Patricia and the run appeared to be a boring out and back (three times!) hilly course. No one here was making any of this sound pretty. Better I make my own presumptions. Her response: “the people are nice”. Ha! I had to laugh. 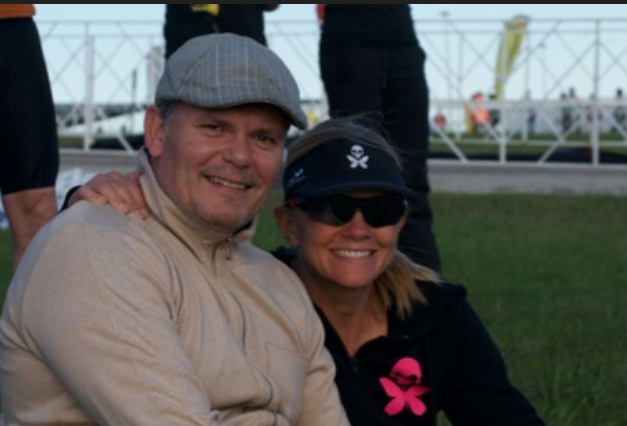 At that point I couldn’t wait for the surprises that found me on race day. I thought to myself this outta be good. 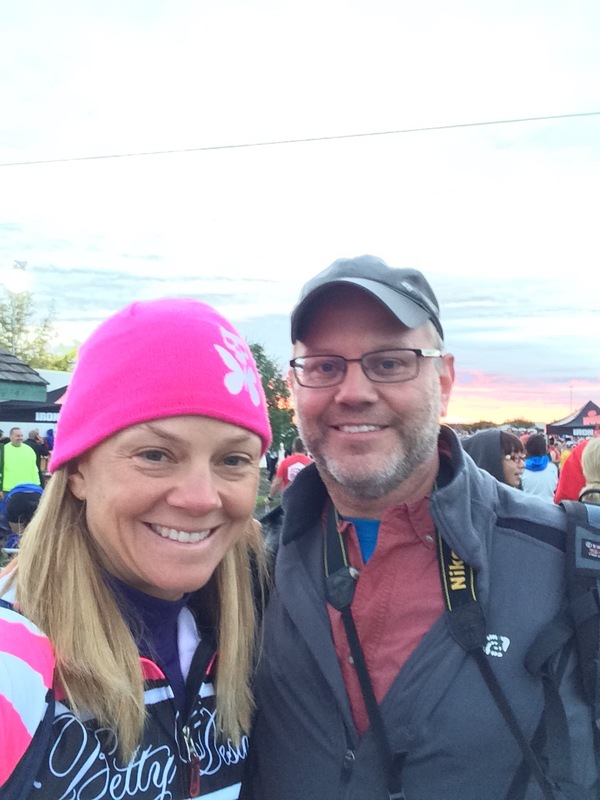 I signed up for Austin 70.3 because… well. It’s Texas. Family and friends live there, mom drove down from Dallas, and it reminded me of my earlier Tri years :). I also needed a good cap to the somewhat disappointing season of Half Ironmans I had previously in the year (due to various accidents and injuries) and the November 8th race seemed to fit the goal. Nothing like having A LOT of family and friends by your side! I felt strong; I worked hard, and was as ready as I’d ever been (or could be trying to balance life in the midst of it all). So I made the conscious decision to “make the day worth it”. Do what I came here for. And it was as simple as that!! Smile (mostly laughing) and move on. Race morning arrived quickly.. 4:15am wake up time my body was like what are you doing to me?! Two hour time change, not going to sleep till 2:30am the night before …. Blah blah. Get over it. I adapted quickly and got excited as I noticed a lack of raindrops on the window. This is my day! My brother ready to put in a 12 hour day! My brother was excited to take the early (midday, and evening) role of Sherpa and I loved having him there (he can be very witty in times of need). It was very cold (temp in 40s) and windy – but I’ll take that over cold, windy and raining any day. Swim. A beautiful lake that looked like a very choppy ocean. I found out all too soon the wind had a nice rippling effect on the lake and created some nice chop…. Just another element to challenge me. I’m game. Our age group wave was full of amazing positive women and the energy was high. Nice people. Ready!!! Boom! The gun went off. I was so happy to be racing!!! Make the trip worth it. 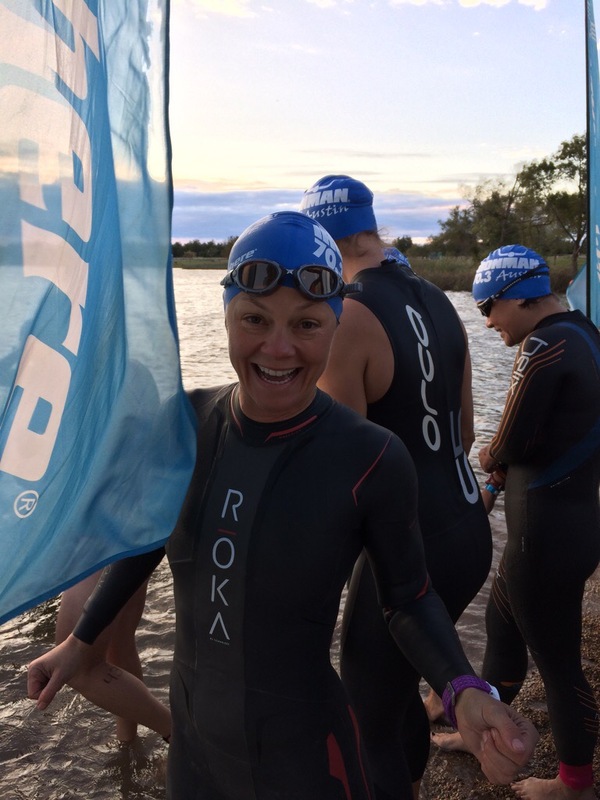 The swim was one of the toughest I’ve had in quite some time but I felt fantastic. 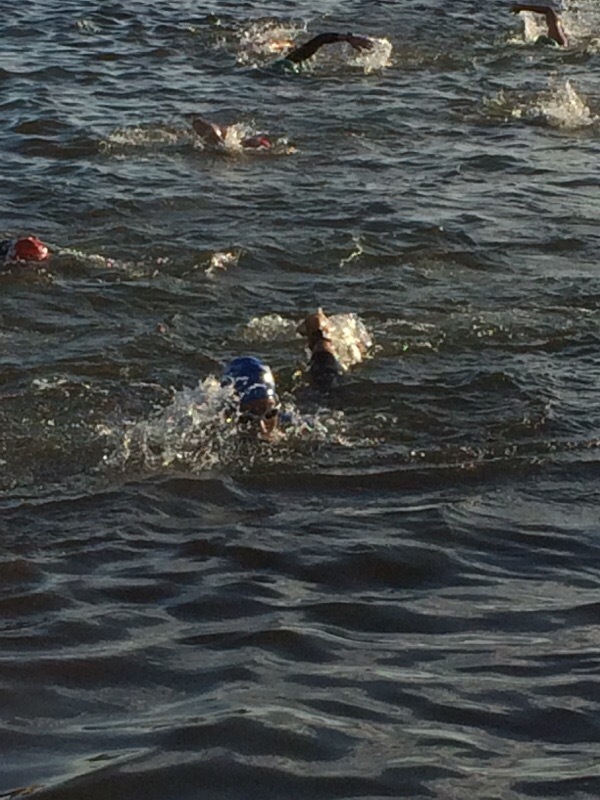 The swim consisted of choppy waters and a lot of maneuvering through athletes in earlier waves. I was with a “friend” (fellow age grouper) but unfortunately lost her after about five hundred yards due to all the people. Turned out I found her again towards the finish and we finished 1-2. I was amazed at my swim time knowing how rough it was out there and how the current wasn’t at our back (later found out they had to pull 100 people from the water). Saw a dear friend (Shannan!) first thing out of the water and my brother on the hill up to the transition. Happy. Back to the wind thing I mentioned earlier. Holy moly it was Kona-esque!!. The first ten (ish) miles were headwinds and potholes. The next ten were similar…. Add in a few railroad tracks and bumpy roads and now you have yourself a challenging bike course! This woman passed me and said: “this course is legit”. Agree. More winds, more hills, and very large potholes to get through. You had to be ON and focused no doubt. Following the swim, athletes continue on to a scenic, rural, one-loop, 56-mile bike ride passing through rolling Texas farmlands. Athletes will view expansive ranches, cedar-covered vistas, sunflower fields and prickly pear cacti. Hello Texas! It was scenic; I’ll give it that. Did anyone see the sunflower fields? I might have to go back for that one. I did see some tractors and a few very nice Texans cheering along the way. And some friendly sheriffs (back to the the “people here are nice comment”) making sure no cars hit us (always a good thing). I got over the fact I was only going 12 mph because I figured it was a loop and we had to get back to the start. There had to be a tailwind! Yes, there was. And yes, every time the wind was at your back it felt fantastic. Unfortunately, the time the wind was at your back was minimal (at one point the last fifteen miles I thought I was going to PR and then – bam – headwind). It all just kept you on your toes. Stay focused. As I imagined I would (there was a lot of bike debris along the road), I launched a water bottle at about mile 18. Damn. Nutrition. Calories. A very friendly volunteer let me know he will pick it up (it’s a penalty to litter, rightly so) and discard in trash along the street. I think he said that for about four hours straight! Good thing I stashed some extra Bonk Breakers! I felt strong but really ready to see mile marker 50. These next few miles (bike course is 56 miles) will be beautiful and amazing (see how you can mess with your mind?!). Smile. I rolled into T2 and saw the family. The entire freaking family!! Hubby, kids, my mom, brother, sister-in-law, their kids, high school friend, a few Manhattan Beach friends, local friends, some Bettys, and ….a lot of additional people that came out to cheer. Texas IS nice!! Support makes a race. Enough said. As I turned in my bike & bike shoes for my running shoes I had this entire peanut gallery critiquing (I mean cheering) me through the transition process. Talk about the pressure! I loved it! Feel the family in your heart. I was off. The run course was three loops, hilly, and boring in description. No sunflowers mentioned nor tractors! I went in with a very open positive mind. Let’s see what this is all about. Few runners get excited about an out and back course you have to repeat 3 times, but I was determined to. My report? It was actually pretty great. You know why? The turn around was crazy loud full of energy and excitement. My friends and family were spread out so every few steps at the turn I would see someone new. 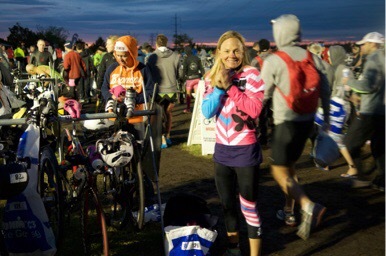 I wore my Betty kit with pride as I cheered on teammates and got some shout-outs from the crowds. 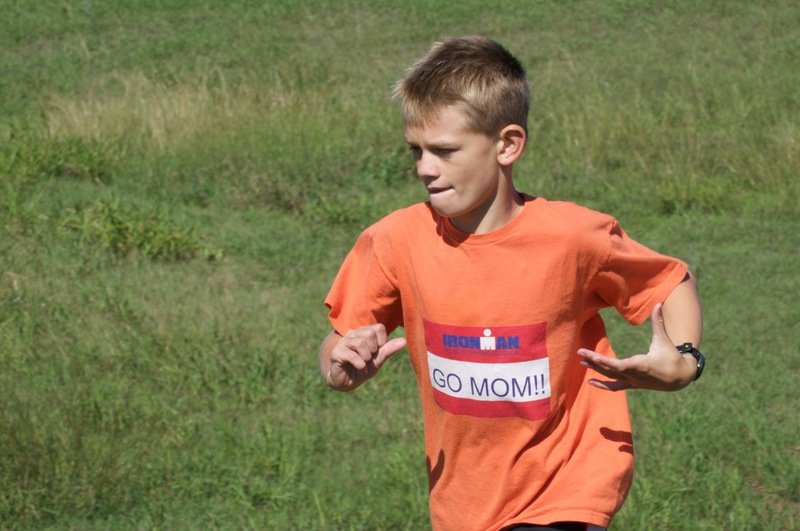 My son even ran alongside me “go mom, you’ve got this! !” (Hello! My dream!!). He didn’t even get a cramp this time 😳 He was inspiring. The kids pretty much took over the water station at the turn-around! My hubby put his pointer finger up and mouthed “first” to me with a great big smile. Happy. Everyone was so excited it fueled me for the next loop. As each loop got significantly more difficult, I needed them even more. I was having some issues with my hamstring and quads that at times left me wobbling (i.e. falling). Ugh!!! I was in first (FIRST!!!!) and – apart from that leg thing – I felt so amazing!!! 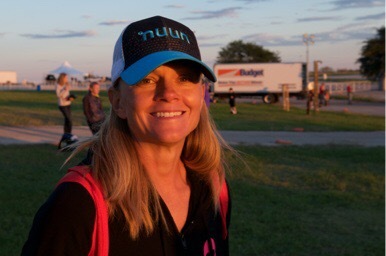 Nutrition was spot on (thank you Nuun and Bonk Breaker!! ), training spot on – but the leg – ARG!! SHUT UP LEGS!!! I cautiously proceeded, as the pain got worse. You’ve got this. I changed my stride a bit and just wanted to run like the wind (ha ha literally) but legs were telling me something totally different. Hills and wind. Speed up. Wobble. Slow down. You’ve got this. I will say it is so hard when mind and heart (and mostly body) feel great but the speed just isn’t there. Stay positive. Smile. Go!!!! I ran into the arena for the finish with a big smile on my face knowing I had persevered thru a very very enduring day. It wasn’t a PR, but it was a tough course with tough conditions (some said IM Texas was easier which I find very very hard to believe) and all the times represented that. I saw so many struggles (people resting on kayaks during the swim, flat tires, ambulances, cramps, etc. etc. the list goes on) but all these athletes pooled together to offer encouragement and support. The athletes were nice. I was holding out for the strong hope I won my age group and hubby soon confirmed 2nd. I didn’t see her at the time (too many people doing loops you had no idea whether they were on their first or last, or your age group or not) but after the fact I remember her. She was running by me like the wind (Fast!) around mile 12 (turns out she is nice too, so it’s ok). I found this quote I found appropriate: “Don’t beat yourself up. You are not a finished product. You are still a work in progress.” Perfect. I have something to work on! And I’m good with that. A work in progress (that’s me!). But it wasn’t. It was about the combined time of swimming, biking and running (as it should be). As disappointed as I was I didn’t want to dwell on it and needed to move on. Podium finish & a slot to Worlds was the goal and I’d say 2nd is pretty damn remarkable considering the day and days leading up to the day! But I will say (she how hard it is to move on!?) it is a terrible feeling knowing you were leading a five+ hour race until the final 7 minutes. But 2nd! 2nd!! Happy!! It will haunt me for a bit but the truth is I had absolutely nothing left. Nada. I put it all out there. 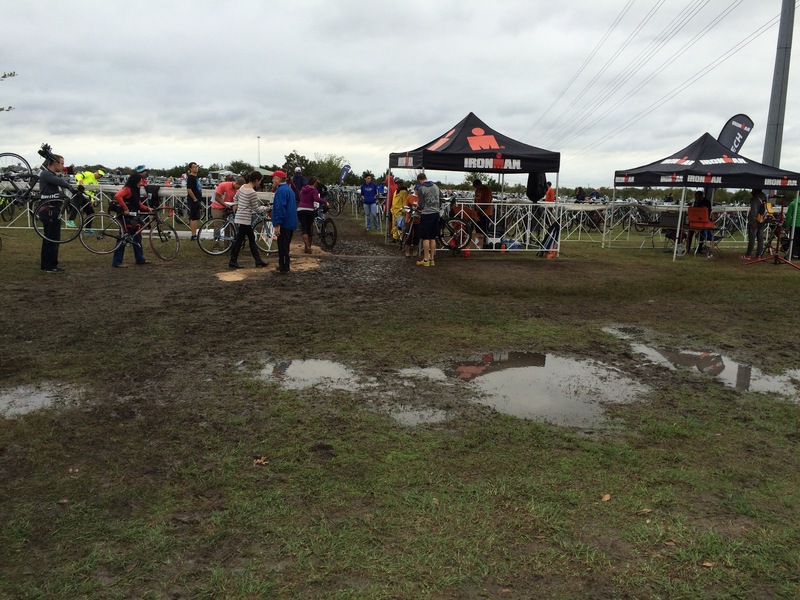 Although I didn’t finish as strong as I would’ve liked, I wasn’t crawling either… So I have that going for me. The best part about the finish? Apart from actually being finished… Was my family. Hubby and the kids just had this look of pride to them that warmed my heart. My mom was thrilled to be seeing me doing what I love and achieving my goals. My brother, his wife and his kids were full of excitement, enthusiasm, and questions. My friends (and their kids) had huge smiles knowing I had overcome a lot just to be there. My sister (who watched me virtually throughout race) was immediately on the phone with shouts of congrats. I was smiling ear-to-ear having such an entourage of love surrounding me. All of a sudden, second place felt just perfect. And perfect it was as I earned myself a slot to the 2016 World Championships in Australia. Yeeee haw!!!! SMILE and you can achieve anything! Amazing!! Congrats on your podium finish! That was the toughest race I’ve ever done and it really was all about keeping the mind positive. Way to go Betty!